I know it's only Tuesday but a lot of you will be away from the internet (gasp) in the latter part of this week so I'm giving you the early heads-up on a show going on at Emo's this Saturday night. 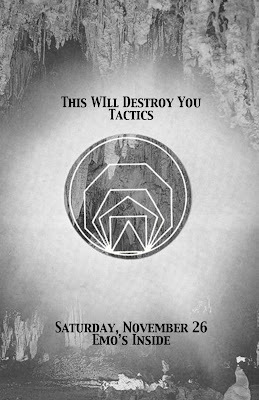 You can catch This Will Destroy You at classic Emo's on Red River, tickets are $15-$17 depending on when you buy them but I have 3 pair to giveaway. Not only that, one of those 3 sets of tickets will come with, Tunnel Blanket, the new album from This Will Destroy You pressed on colored vinyl as well as an 11 x 17 poster. 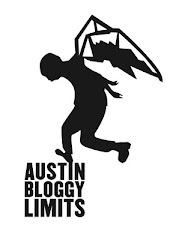 To win is simple, all you have to do is e-mail contest@austinbloggylimits.com with "TWDY" in the subject and tell me why you want to win. The winners will be chosen at random on black Friday (the day after Thanksgiving). All 3 sets of winners will get in to the show free of charge and one of the lucky winners will get the prize pack with the vinyl and the poster. In what, could be, the most perfect musical pairing to date, Tactics will be playing the support slot at this Saturday's show. The latest release from instrumental rock group, Tactics is the single, Titan. If you think it sounds good on their Bandcamp wait until you hear them perform live. There really aren't very many opportunities left to see shows at Emo's Red River location but this show is the perfect sort of last hurrah. Local bands, with a big sprawling songs, cheap beer in hand that's the way I want to remember classic Emo's.